Pip Wilson bhp: You may have heard/used the Blob Tree ? Here is a whole book of different ones. 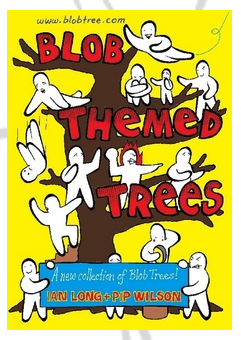 You may have heard/used the Blob Tree ? Here is a whole book of different ones. Quite plainly and simply, this is a book of inspirational quotations which have been created to stir up thought and lead to personal change... comforting the disturbed and disturbing the comfortable in our lives. A brand new practical resource The Big Book of Blob Feelings 2 coming soon to Speechmark. Enjoy 20% off when you pre-order before the 31st March. Simply use the code: BF20 at the checkout to take advantage of this fantastic offer! This practical resource is a follow-on from the hugely successful ‘Big Book of Blob Feelings’. Big Book of Blob Feelings 2 is designed to be used as an extension of the work covered in the original. • Blob Theory • Blob trees the id/ego/superego, needs, shadows Emotions • anger, anger cycle, calm, depression, disappointed, happy, hate, hyper, jealousy, lonely, mixed-up, numb, paranoia, rejection, sad, trauma, worry Developmental/issues • bridge, clouds, doors, feelings, holes, pit, pitch, stairs, families, home. Each picture is accompanied by ideas and questions to kick start class, group or one-to-one discussion. Also new for this edition, "Drawing the Line" section.